Trump keeps open the possibility of negotiating an agreement to denuclearize Iran. 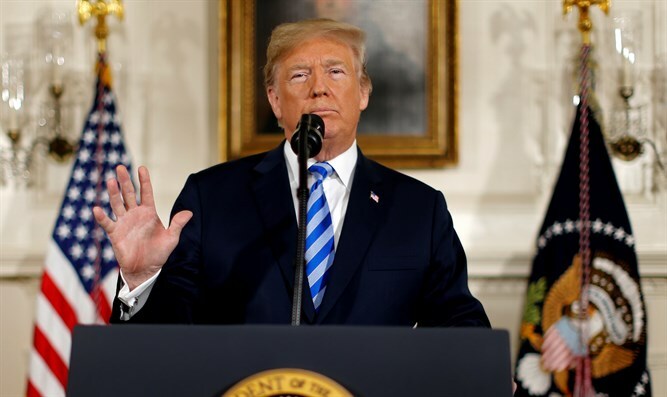 U.S. President Donald Trump on Tuesday kept open the possibility of negotiating an agreement to denuclearize Iran. “We’ll see what happens, but we’re ready to make a real deal, not the deal that was done by the previous administration, which was a disaster,” he said during a speech to the Veterans of Foreign Wars, as quoted by Reuters. Trump pulled out of the 2015 deal, under which sanctions on Iran were lifted in return for curbs to its nuclear program, in May. Washington has since told countries they must stop buying Iranian oil from November 4 or face financial measures. Trump’s comments came two days after he rattled his saber at Iran on Twitter, warning Iranian President Hassan Rouhani not to threaten the United States again. "To Iranian President Rouhani: NEVER, EVER THREATEN THE UNITED STATES AGAIN OR YOU WILL SUFFER CONSEQUENCES THE LIKES OF WHICH FEW THROUGHOUT HISTORY HAVE EVER SUFFERED BEFORE," wrote Trump. On Monday, Iranian Foreign Minister Mohammad Javad Zarif fired back at Trump. “Color us unimpressed: The world heard even harsher bluster a few months ago. And Iranians have heard them —albeit more civilized ones—for 40 yrs. We’ve been around for millennia and seen fall of empires, incl our own, which lasted more than the life of some countries. Be cautious!” he tweeted. Mattis, speaking at a news conference in California, listed his many concerns about Iranian actions in the Middle East, including Tehran’s support for President Bashar Al-Assad in Syria’s civil war and for Houthi militants fighting the internationally recognized government in Yemen. “It’s time for Iran to shape up and show responsibility as a responsible nation. It cannot continue to show irresponsibility as a revolutionary organization that is intent on exporting terrorism, exporting disruption, across the region,” said Mattis, according to Reuters. “So I think the president was making very clear that they’re on the wrong track,” he added.